At the risk of betraying my age, I still remember the original James Bond movies – the ones with Sean Connery, Roger Moore, and later a younger Pierce Brosnan. A crusty Q would give Bond a car capable of outlandish transformations, and a watch that could do virtually anything. My adolescent self craved Bond’s gadgets, particularly his laser-shooting, satellite-phone boasting, space station- controlling watches, hiding behind a suave and distinguished veneer of a high end timepiece. Well many years later, the latest LTE Galaxy Watch is here, and I can’t help feeling that Q would be impressed. 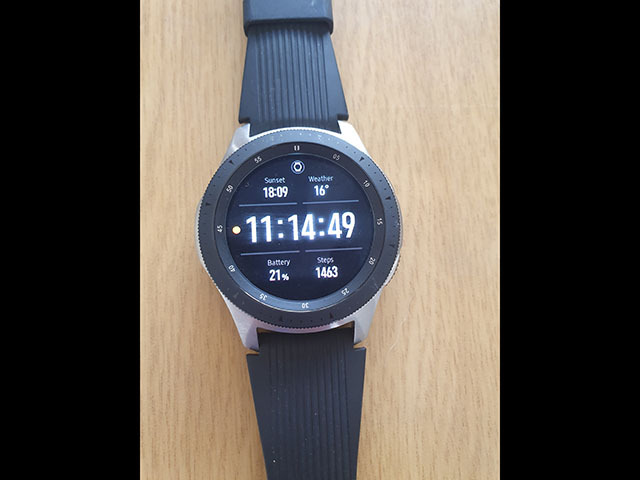 Earlier this month, the LTE version of the Samsung Galaxy Watch debuted alongside the launch of Vodacom’s eSIM and OneNumber. Subsequently, the chance to go hands on with the device proved it to be infinitely more useful than I originally expected, and I have come away delighted by the convenience it affords. To start with though, the 46mm version reviewed here looks like a classy watch, our version was black and silver. So it is largely like any decent watch you would buy, but thanks to its digital display, you can customise the face in an array of ways, from appearing as an analog timepiece to a digital watch. 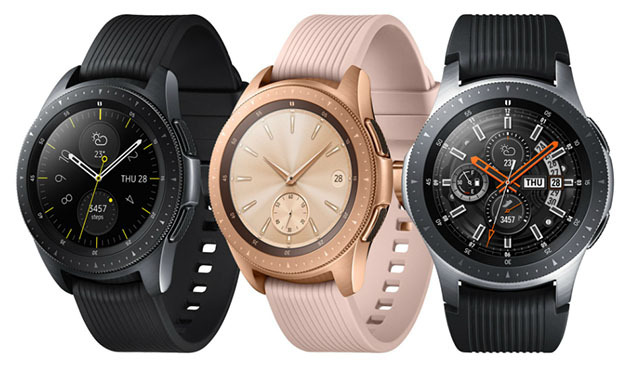 And, if you don’t like the tens of faces that come preloaded, there are scores of options available for a small fee on the Samsung store via a dedicated Watch Faces store. However, it is with the eSim that things really get interesting. The watch is paired with your number. This means that any call coming through rings on both one’s phone and watch - although you can set it to either ring on one device or the other, or to ring on both. Since my phone tends to be somewhere on my desk when I am working, or in a bag when I’m out and about, a ringing phone has usually meant a hurried scramble to find it, or retrieve it, before the call goes to voicemail. With the watch though, that’s no longer an issue. I have found myself relishing being able to answer the call on my wrist and start the conversation while I rescue my phone from a mound of papers at my leisure. You can also then seamlessly switch from talking on your watch to talking on your phone. It works perfectly and is a pleasure. That being said, the watch’s speaker is loud enough to carry on a conversation on it alone, provided there isn’t a large amount of ambient noise, and I was told that I came through clearly by the people on the other side of the line. In a similar vein, notifications – whether email, WhatsApp or SMS - are similarly are mirrored on the watch. This means that when walking and running my dogs, when I left my phone indoors, I could still be alerted to something urgent and choose to respond straight from the watch if need be. I can similarly see it being a benefit when exercising or going for a long walk. There were two other use case scenarios where the watch’s utility really won me over. Sitting in a conference, with my phone on silent and tucked in a bag, I received an urgent notification on it to go to a different conference room for another session that was about to start. I appreciated how discrete getting notifications on it are, especially in a setting where constantly pulling out one’s smartphone would be distracting or rude. Secondly, because you can install Google Maps on the device, it made following directions to a difficult destination much easier without having to glance at my phone, in an area where I didn’t want to invite a smash and grab by mounting my smartphone on my dashboard. Also, you are much less likely to be ticketed for glancing at your watch while at a traffic light than pulling out your smartphone and doing the same. Beyond that, there are the usual functions that work as well as they would on a non-LTE smartwatch. The device serves as a great exercise companion, from monitoring your steps, heart rate, stress levels, sleep to advising when you have been sedentary for too long and suggesting an exercise. 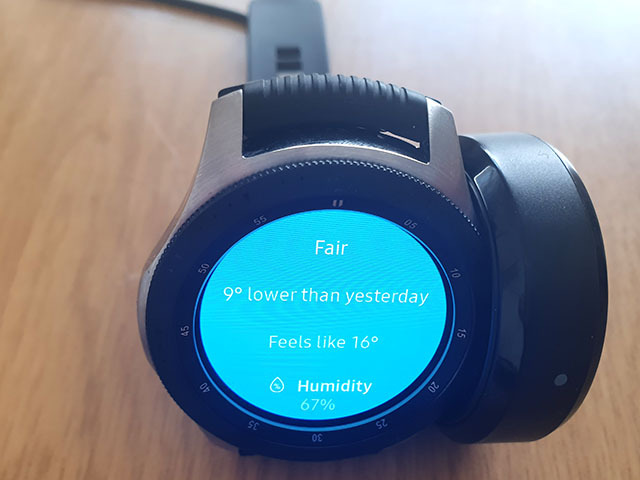 It can also detect what exercise you are doing and offer up information accordingly, although I have had a couple of instances where the watch thought I was cycling while I was actually driving. GPS, along with a barometer and altimeter, are also onboard. The 1.39” AMOLED display is sharp, and I found that its 360x360 resolution made it easy to stay on top of notifications. That being said I would not try go through all my email on the thing – although you could – if only because reading lots of small text doesn’t feel great on my eyes, irrespective of whether it is on a screen or print. As with the Samsung phones the interface is a breeze to use. An outer ring serves as the scroll wheel and just two physical buttons allow you to either go home or go back. Everything else is accessed by a small button on the screen. You might be thinking surely the screen is too small to access touch buttons accurately? Not so. My experience has been that tapping an email or Instagram icon, for example, works beautifully, and I don’t have toothpicks for fingers. Specs-wise, its 1.15 Exynos 9110 dual Core processor does the heavy lifting, alongside 1.5 GB of RAM. You also get 4 GB of storage, so enough to store some music and photos and then play the latter through wireless headphones. One caveat, the number of notifications you may receive can take a little adjusting to. Depending on the frequency of your emails/instagram updates, tweets and so on, you may want to adjust what exactly is allowed to ping for your attention, lest you find yourself looking at your watch every couple of minutes and developing the attention span of a rabbit on cocaine. I eventually settled with just allowing messages, emails and banking notifications. A few other small but still significant touches were also appreciated. The screen switches off when not in use, saving battery life. A gentle turn of your wrist and it comes to life, so it’s there when you need it, and saving battery life when you don’t. Speaking of which, I found battery life to be pretty good, lasting between three and four days between charges, perhaps five at a push, depending on frequency of use. Lastly, I was happy to find the watch strap is particularly comfortable, a factor which has largely determined whether I wear any watch or not. Price wise, the 46mm version is around R6 500. If you are on Vodacom though, you can add it to your contract, and pay it off. And yes, I think it is wholly worth it.